crabs including low molt success rate and decreased larval survival. Warming oceans, sea level rise, and hypoxia events are all likely to stress crab populations, most likely causing a shift in range, distribution, and habitat use. Increasing ocean temperatures will also likely affect survivorship of multiple crab species. Changes in ocean currents are expected to affect recruitment of larvae to the estuary and alter nutrient availability. Since the late 18th century, the average open ocean surface pH levels worldwide have decreased by about 0.1 pH units, a decrease of pH from about 8.2 before the industrial revolution to about 8.1 today. A 0.1 change in pH is significant since it represents about a 30 percent increase in ocean acidity (the pH scale is logarithmic, meaning that for every one point change in pH, the actual concentration changes by a factor of ten). Scientists estimate that by 2100 ocean waters could be nearly 150% more acidic than they are now, resulting in ocean acidity not experienced on earth in 20 million years. The best Pacific Northwest ocean acidification data we have so far are from the Puget Sound area where pH has decreased about as much as the worldwide average (a decrease ranging from 0.05 to 0.15 units). estimated 30 species of crab living in our estuary. Climate-related changes will likely come from the increasing acidification and temperature of ocean and estuary waters, hypoxia (low dissolved oxygen levels) in ocean and estuary waters, sea level rise, and change in oceanographic conditions, each of which are discussed below. 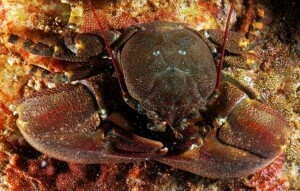 Increasing acidic conditions in the ocean are expected to have major consequences for invertebrates with shells or exoskeletons, such as crabs. 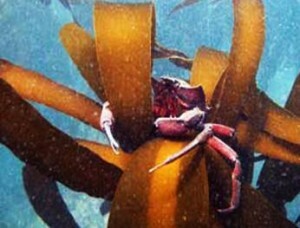 For example, adverse effects of ocean acidification were found in laboratory experiments by Long (2013) who found that only 25% of female red king crabs (Paralithodes camtschaticus) molting in acidified water were able to molt successfully, while 100% of those in the control group (standard ocean salinity) successfully molted. Long also made the surprising observation that for many crab species — including Dungeness crab — calcium content in freshly molted crab exoskeletons is higher in acidified water than those molting in standard sea water. Long suggests this is most likely due to the ability of many crab species to increase their internal pH during a molt cycle; the increased pH range between their bodies and the more acidified water could lead to a higher calcium content in exoskeletons. However, this physiological process comes at a high energetic cost, seen in the drastic depletion of lipid reserves in molting adults, leaving them depleted of a major energy source required for proper growth. In further experiments, Long saw survival of red king crab larvae decrease by 13% in acidified water. Intertidal crabs live in a constantly fluctuating environment as the relatively stable conditions of high tide give way to stressful low tide conditions. Changes in oxygen and pH can be drastic and occur very rapidly in shallow isolated tide pools, but these changes are temporary and only last until the next high tide. Ceballos-Osuna et al. 2013 found that the intertidal porcelain crab (Petrolisthes cinctipes) had 30% reduced survival of juveniles when continuously exposed to low pH waters. Therefore, intertidal organisms that are presently tolerant to brief changes in pH could still be detrimentally affected by ocean acidification. Increasing Ocean Temperatures Worldwide, ocean temperatures rose at an average rate of 0.07° C (0.13° F) per decade between 1901 and 2012. Since 1880, when reliable ocean temperature observations first began, there have been no periods with higher ocean temperatures than those during the period from 1982 – 2012. The periods between 1910 and 1940 (after a cooling period between 1880 and 1910), and 1970 and the present are the times within which ocean temperatures have mainly increased. One consequence of a warming ocean may be decreased stability in ocean habitats, and thus decreased survivorship of multiple crab species. Brown and Terwilliger (1999) found that Dungeness crab megalopae and first instar juveniles are more temperature sensitive than older crabs, in part because they are spawned in stable ocean conditions before moving to the warmer and more fluctuating temperatures in estuaries during their adult stage. Destabilizing the ocean conditions would likely have deleterious effects on the crab’s sensitive younger stages. Brown and Terwilliger also noted that survival at all larval stages decrease as water temperatures approach 20° C (68° F). To put this in perspective, ocean waters near Coos Bay ranged between 8.6° and 18.2° C (47.5° and 64.8° F) in 2011 (NOAA National Data Buoy Center n.d.), suggesting that further research is needed to understand how rising ocean temperatures over the next several decades could ultimately stress crab juveniles past their limit in the Coos estuary. Others have documented temperature-related stresses on crab physiology and life histories. For example, Wild (1980) found that increases in water temperature decreased hatching success of Dungeness crab eggs, especially when temperatures over 13° C (55° F) were reached. On average, 685,000 eggs per crab hatched in 10° C (50° F) water, while only 14,000 per crab hatched at 16.7° C (62° F)(Wild 1980). Normal development from egg to larvae in Oregon takes place between 10° and 13.9° C (50° and 57° F)(Rasmuson 2013). Stillman (2003) reported that thermal stress from global climate change may already be affecting intertidal species such as porcelain crabs (Petrolisthes cinctipes). This has been seen in Monterey, California with a decline in Porcelain crab abundance of over the past 60 years, corresponding to a rise in water temperature. Stillman suggests that those species that have evolved to survive high temperatures for short periods of time, such as intertidal crabs, are already near the limit of their maximal temperature and will therefore be particularly susceptible to sustained increases in water temperature. Another likely outcome of warming oceans is a shift in the timing of larval development. This means that the evolutionarily established timing of crab larvae development may no longer remain in sync with the seasonal blooms of their planktonic food sources (Pörtner and Farrell 2008). Moreover, warmer ocean waters are expected to change the community composition of the nearshore ocean, including upper trophic food web organisms (e.g. salmonids), which rely on crab larvae as a main component of their diets (Pörtner and Farrell 2008). A warming ocean is also likely to cause a shift towards the poles in all invertebrate species as well as a vertical shift towards deeper, cooler habitats, changing the population dynamics in the estuary and nearshore ocean (McConnaughey and Armstrong 1995). Especially apparent will be population changes in species where the Coos estuary is near the Northern or Southern extent of their range. 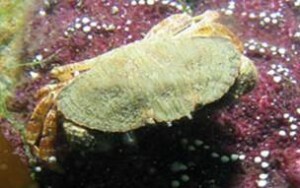 (e.g., the pygmy rock crab, Cancer oregonensis). Hypoxic conditions can stress crabs, especially subtidal populations, which are not regularly exposed to low oxygen conditions. Increasing temperatures compound the effects of hypoxia. In turn, hypoxic events can reduce the thermal tolerance of some crabs. This problem will be particularly relevant to intertidal crabs, which are sometimes living near the limit of both their thermal and hypoxia tolerance (Metzger et al. 2007). Drowned river valleys, such as the Coos estuary, provide valuable intertidal habitat to numerous crab species. If sedimentation rates do not allow intertidal marshes to keep pace with sea level rise, many of these areas may be lost due to rising sea levels, especially where no low elevation lands exist for the marshes to migrate to (McConnaughey and Armstrong 1995). Changes in oceanographic conditions, such as local wind patterns, ocean currents or other weather cycles, raise questions about how the local effects of long term climate change will affect the distribution of pelagic larvae, the timing of spring transition and the recruitment of crabs into the Coos estuary. It is unclear what exact effects these changes will have on the planktonic larval phase of crabs, but it is likely recruitment will be altered (McConnaughey and Armstrong 1995). Shifts in the timing or strength of spring transition will also alter nutrient availability for larvae, affecting their health and survival (McConnaughey and Armstrong 1995). Brown, A. C. and N. B. Terwilliger. 1999. Developmental changes in oxygen uptake in Cancer magister (Dana) in response to changes in salinity and temperature. Journal of Experimental Marine Biology and Ecology 241(2): 179-192. Ceballos-Osuna L., H. A. Carter, N. A. Miller, and J. H. Stillman. 2013. Effects of ocean acidification on early life-history stages of the intertidal porcelain crab Petrolisthes cinctipes. Journal of Experimental Biology 216(8): 1405-1411. Long, C. W., K. M. Swiney, and R. J. Foy. 2013. Effects of ocean acidification on the embryos and larvae of red king crab, Paralithodes camtschaticus. Marine Pollution Bulletin 69(1-2): 38-47. McConnaughey, R. A., and D. A. Armstrong. 1995. Potential effects of global climate change on Dungeness crab (Cancer magister) populations in the northeastern Pacific Ocean. Canadian Special Publication of Fisheries and Aquatic Sciences 121: 291-306. Metzger, R., F. J. Sartoris, M. Langenbuch, and H. O. Pörtner. 2007. Influence of elevated CO2 concentrations on thermal tolerance of the edible crab Cancer pagurus. Journal of Thermal Biology 32(3): 144-151. Pörtner, H. O., and A. P. Farrell. 2008. Physiology and Climate Change. Science 322(5902): 690-692. Stillman, J. H. 2003. Acclimation Capacity Underlies Susceptibility to Climate Change. Science 301(5629): 65.